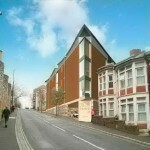 Is this what we want to see on Horfield Road? Their Planning Application claims that the building ‘presents a unified facade to the road without being monolithic‘. It talks of ‘a bold, dramatic gesture at roof level‘ and ‘an eye-catching attractive element in the roofscape‘ They say that this new block of flats ‘echoes the wall opposite, creating an area of visual compression – a gateway…‘ and ‘will reinstate the street frontage and residential fabric‘. They also claim that ‘members of the local community have been involved with the design from the outset’ and ‘the site is not within the Conservation Area’. Both claims are wrong. This is an important route into town used daily by hundreds in cars and on foot. The design should contribute to the appearance and safety of this route, not turn its back on it. The building could be set further back on the site (for example, as a courtyard with a garden in front), and should not project so much above the two-storey houses on either side. We question the provision of off-street parking here, the resultant loss of amenity space and the safety of car access onto this busy road with its fast traffic. ignores context and wrong scale. A 3-storey stepped form might be acceptable. The new pink and blue houses next door provide a good precedent in terms of scale and form. The large blank street elevation is extraordinarily insensitive. The road facade is totally unacceptable. Particularly agree with the KCG comments. This garden is very pleasant. They are taking away a rather restful spot. The thought of 3 cars reversing into the fast-moving traffic is not good. New houses next door have no off-street parking. This sets a good example. What you can do: email north.planning@bristol.gov.uk before May 28th and tell them what you think of this scheme: ref: 08/01713/F 78-84 Horfield Rd, BS2 8EQ.